History of Hampi: The beauty of Hampi shows how important and interesting is the history of Hampi. At the beginning the site was under the rule of Maurya Dynasty. The edicts of Emperor Ashoka in Nittur and Udegolan show that the site was under Mauryan Empire. 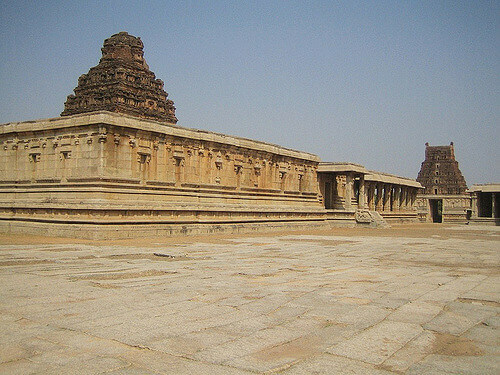 By 10th century the site became a centre for religious and cultural activities under Kalyani Chalukyas. After this the site was influenced by other dynasties and from 1343-1565 Hampi became an important site of Vijayanagara Empire. The Empire built its capital, Vijayanagara around Hampi site. The dual site Hampi and Vijayanagara probably became India’s richest place and world’s second largest city after Beijing. This was probably because both the place were on the Banks of River Tungabhadra on one side and hilly terrains that was surrounding the other three sides. The city is also known as Pampa Kshetra, Kishkindha-kshetra or Bhaskara-kshetra. Pampa is another name of Goddess Parvati. The city has many mythological stories to connect the city with God and Goddess. According to Hindu mythological books, Goddess Parvati decides to marry Lord Shiva. On hearing to this news her parents discourage her to marry Lord Shiva. In order to make Shiva accept her to marry, Parvati disowns all luxury and started to live a yogic life like Lord Shiva. On seeing this lord Shiva accepts her proposal to marry. Also the river near the Hemakuta Hill came to be known as Pampa River. Vijayanagara Empire built many temples in Hampi and also maintained a very good infrastructure. The empire improved roadways, waterways, agriculture, and transportation. The art and architecture of the temples were predominantly South India Hindu architecture. The Portuguese and the Persian traders called the site as one of the most beautiful place in the world. In the year 1565, in the battle of Talikot, the Muslim rulers captured and beheaded the Vijayanagara ruler in a very horrifying way. Thus Vijayanagara came under coalition of Muslim rulers and the city of Hampi was burnt and looted for six months finally it was ruined. Hampi has around 1600 monuments that were mostly built during Vijayanagara period between 1336-1570. Most of the Hindu Kings of Hoysala Empire of South India built temples of Goddess Durga, Lord Shiva and Hampa Devi. Vijayanagara Empire ruled South India for nearly 200 years. Hampi is of the important site for Archaeological survey of India for excavations and to learn more about Vijayanagara Empire. Virupaksha temple: Also known as Pampavathi Temple, this temple is one of the oldest Hindu monuments in Hampi, South India. The temple existed even earlier to Vijayanagara Period. Before Vijayanagara Empire the temple consisted of parts of Shiva, Durga and Pampa temple later on it was extended into a grand and spectacular temple during Vijayanagara Period. 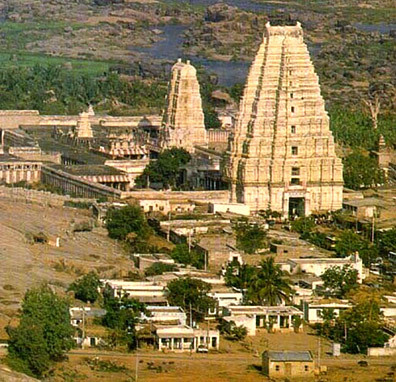 Virupaksha temple is the main centre of pilgrimage at Hampi. The temple is famous for its architecture and beauty. The main temple is dedicated to Lord Virupaksha (lord Shiva) and a Shiva linga in which the face is being embossed with brass. The temple has three main entrance or gopurams the first entrance or the gopuram is being is very large of about 50metres, the second gopurams leads to the inner courtyard which holds many small shrines and the third also known as kanakagiri gopuram which further leads to other shrines and later to Tungabadra river. During the coronation of Krishnadevaraya in 1510 the king dedicated the mandapa and inner gopuram to the temple. Krishnadevaraya was the most famous king of Vijayanagara empire who ruled from 1510- 1529 AD. There are also evidence to show that the temple got further facelift and additions during the Chlukyan and Hoysala period. Another important and famous temple is Vitthala temple. Built in 15th century the temple is famous for the architecture and it was also one of the sacred centres of Vijayanagara Empire. The temple is dedicated to Lord Vitthala, a form of Lord Krishna. The temple is facing towards east and has a gopuram at the entrance of the temple. 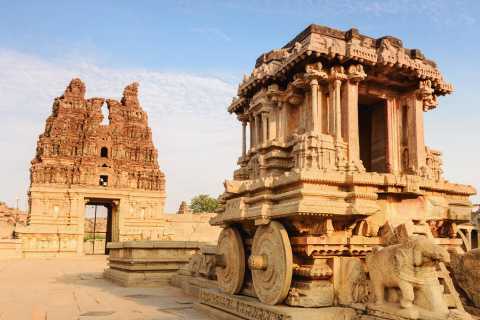 At the courtyard there is a stone chariot of Gaurada Shrine which is the most pictured symbol of Hampi. The mandapa consists of 56 carved beams which are of different diameters, shape and size. The mandapa leads to pradakshina patha and from there it further leads to Garuda Shrine, Kalyana mandapa, Amman Shrine and Utsav mandapa. The hill which lies between Virupksha temple complex and the Krishna temple has many small to moderate temples with water cistern and entrance gate. Built in 14th century some of the structures are of different size that are grouped together from the blocks of stones. Some other monuments that are completed have been designed in Phamsana style. The Hemakuta hill also holds two monolithic monuments of Ganesha, Kadalekalu (peanut) Ganesha and the Sasivekalu Ganesha. There is also temple of Lord Narasimha which is an avatar of lord Vishnu. Pattabhirama temple complex: The temple was built around 16th century and is dedicated to Lord Rama. The complex consists of a main temple, courtyard and a mandapa with a roof in front of the shrine. The complex and the shrine face towards east with a gopuram at the main entrance. The temple has numerous pillars on which carvings are made which depict the themes from the Hindu texts about the Hindu God and Goddess. Badavi Linga temple: Badavi linga temple is a magnificent temple situated near Lakshmi Narasimha temple. It is the largest monlithilc temple in Hampi. The linga has been carved with three eyes. The Linga is built in black stone and has a height of 3 metres. According to the history the temple was commissioned by poor peasant women hence the temple got the name as badavilinga. Badavi means poor and Linga is lord Shiva. The huge Linga is present in a small stone chamber and the sunlight falls on the Linga during day time making it one of the beautiful scenes to see. A water channel is connected to the temple making Linga to be submerged in water. Lotus temple: Lotus Mahal also known as Kamal Mahal or Chitragani Mahal is one of the finest Mahal in Hampi. The palace is in the shape of Lotus with central dome also being carved into a Lotus bud. The style of the Mahal represents indo Islamic architecture. The palace is a two storied building with 24 pillars to support the arched windows and balcony. Lakshmi Narasimha Statue: This gigantic monolithic statue is located on southern side of Hemakuta group of temples. 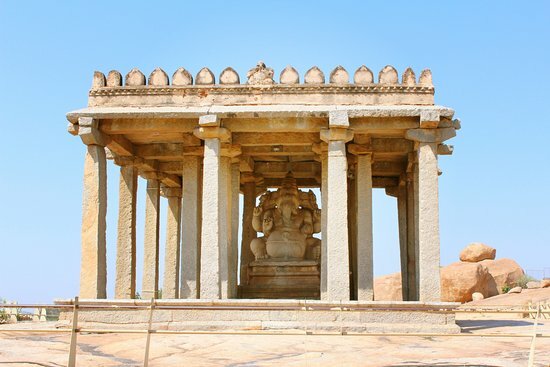 It is one of the major tourist’s attractions in Hampi, India. It was constructed around 1528 AD during the reign of Krishnadeva raya. The original statue had a small figure of Goddess Lakshmi which got destroyed during Mughals attack in 1565 AD. During the attack one of the limbs of the Narasimha statue is broken and one of the hands of Goddess Lakshmi is broken. Now the damaged Goddess Lakshmi is kept in Kamalapura Museum. Ganagitti temple complex: It is a Jain temple dedicated to the seventeenth Thirtankara Kunthunatha. Based on the inscription present in the temple it is believed to have been built in 14th century during the rule of King HariHara II. The temple holds pillars and square sanctum but the Jina’s statue is not there. Another Jain temple that is dedicated to Parshavanatha Thirtankara was built by Krishna Devaraya II around 14th century. The nearest airport is Hubli which is around 143Km from Hampi. Another airport is Jindal Vijayanagara Airport located near Bellary which is around 40Kms from Hampi. Hubli is well connected with Bangalore and Mumbai. The nearest railway station is Hospet which is around 13Km from Hampi. There are overnight train services available from Bangalore, Goa and Hyderabad. And by road there are many government and private buses services from major cities of South India. Distance between Hampi and Bangalore is around 346km which is close to 7hr drive and distance between Hampi and Belgaum is 269km which is close to 6hr drive. Karnataka State Road Transport Corporation has daily buses to Hospet from Bangalore, Mysore and many other places. From Hospet one can take a local bus to Hampi.